Elephant Z-Stools Are Used For Laboratories, Art Studios And More. Elephant Z-Stools are made with an ergonomic Blow Molded Polypropylene seat and chrome plated steel frame for long lasting durability and comfort for lab or art work. Oversized contact area minimizes pressure on floor. 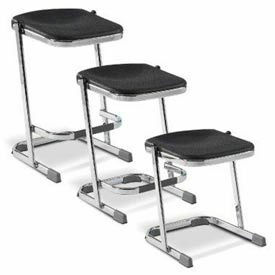 Stools are available in a variety of sizes with or without backrest. 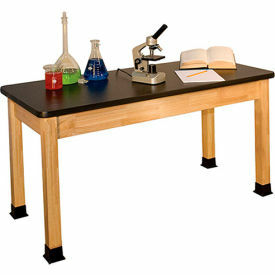 Wooden Frame Science Lab Tables are used in Science Laboratories, Classrooms, Universities and more. Wooden Frame Science Lab Tables are made with solid hardwood frame and legs to provide long lasting durability. Tables have chemical resistant laminate, epoxy resin, laminate or phenolic resin to provide superior chemical resistance. Dual-bolt leg attachment system and adjustable glides provide additional structural integrity. Table lengths range from 48"-72". Widths are 24", 30" and 42". Heights range from 29" -36". Available table colors are Natural, Oak or Ashwood. All products are made to order in the USA. Steel Frame Science Lab Tables are used in Science Laboratories, Classrooms, Universities and more. Steel Frame Science Lab Tables have steel legs and steel apron to provide long lasting durability. 2" Diameter Steel Legs bolted into corner socket in the 3" Steel Apron with over 3,000 pounds of clamping force provide additional structural integrity. Available tops are chemical resistant laminate, laminate or phenolic resin for superior chemical resistance. Rounded corners provide safety. Legs have plastic feet to protect all floor surfaces. Table lengths range from 48"-72". Widths are 24", 30", 36" and 42". Heights are 29" or 36". Some assembly required. 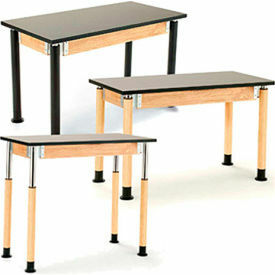 Adjustable Height Science Lab Tables are used in Science Laboratories, Classrooms, Universities and more. 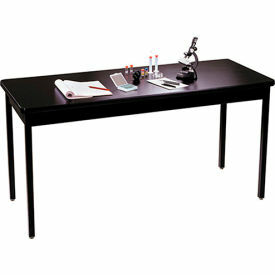 Adjustable Height Science Lab Tables are made of steel to provide long lasting durability. Tops are treated with chemical resistant laminate, laminate or phenolic resin for superior chemical resistance. Table lengths range from 48"-72". Widths are 24", 30", 36" and 42". Heights range from 22-1/2" -37-1/2" to 29" - 41". Table frame colors are Black, Oak and Silver. Legs adjust in 3/4" increment. Adapts for ADA requirements. Easy assembly, with pre-drilled pilot holes. Patented mechanism allows table to rise effortlessly and automatically lock at height setting requirement.